City Church is a growing church family based right in the heart of the fantastic city of Newcastle upon Tyne, and we are all about enjoying God, making friends and changing lives. three profiles were found for City-church.co.uk in social networks. Among other social networks the website is represented in Facebook, Twitter and GooglePlus. The web server used by City-church.co.uk is run by EUKHOST Ltd and located in Great Britain. On this web server 23 other websites are hosted. The language of those websites is mostly english. 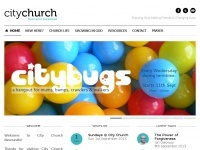 A Apache server hosts the websites of City-church.co.uk. For managing the data of the webpages the CMS WordPress is used. XHTML 1.0 Transitional is used as markup language on the webpages. Indexing the data of the website and following hyperlinks on it is explicitly allowed by robot information.